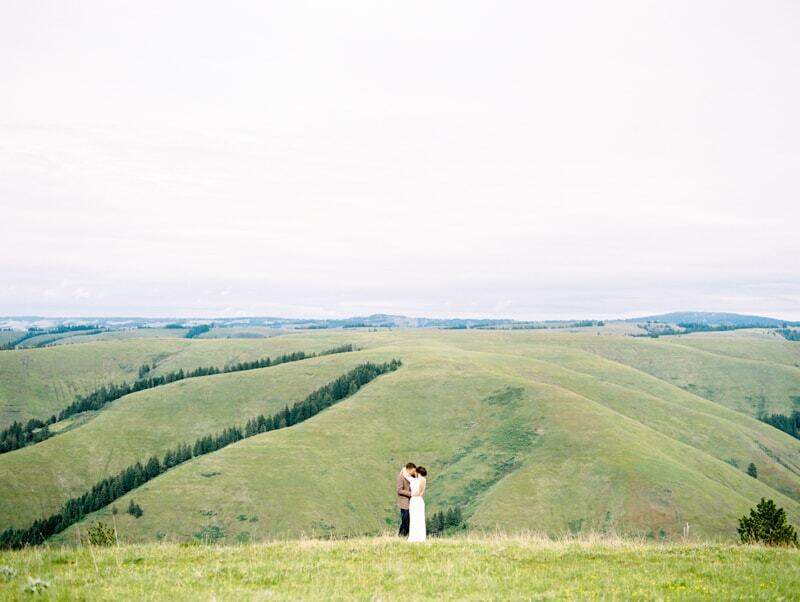 Photographed in the hills of Oregon, this prairie vow renewal is simple, yet rich thanks to the incorporation of vivid colors and expansive views. The lovely bride and handsome groom embrace the outdoor location to make the scenery their own. The letter-pressed invitation suite evokes an antique vibe with its traditional invitation, along with keepsake vow books. The bride wears her hair in a braided updo, complete with curled tendrils near her cheeks. Her dress is ideal for the occasion with its fluttery sleeves, lace fabric and fit-and-flare silhouette. The groom is appropriately dressed for the outdoor ceremony with a wool blazer, gray sweater and light blue shirt, all paired with navy blue pants. Together, the styles of the bride and groom combine for an enchanting, almost antique inspiration, reminding us of styles from yesteryear. A cobalt blue velvet chair showcases the bride’s colorful bouquet. 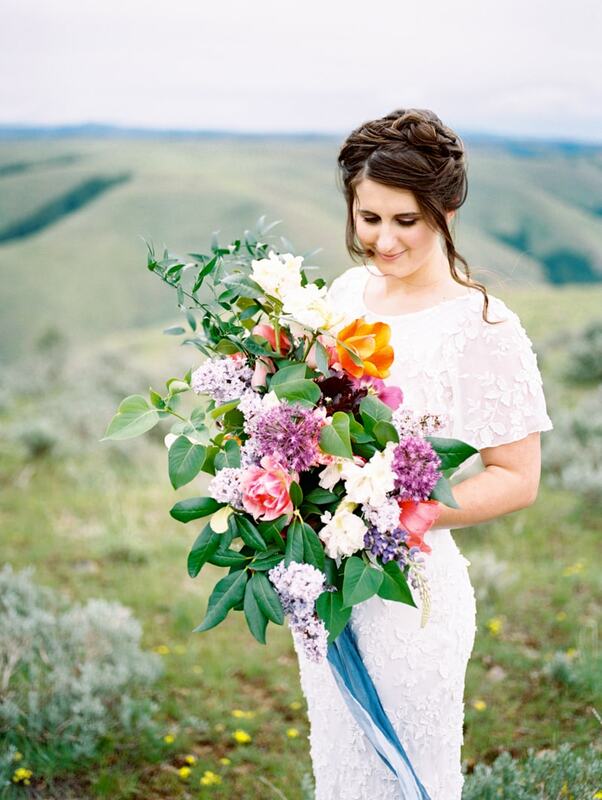 The hues are incredibly enthralling surrounded by the natural tones of the Oregon hills. 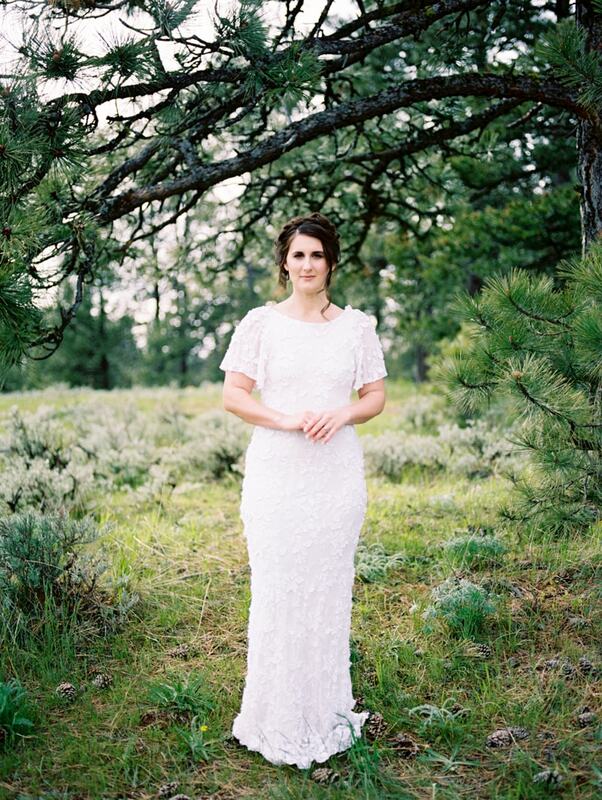 Against the white of her gown, the various tulips, wildflowers and greenery seem to bounce right off the lens. While the oversized bouquet is the perfect choice, it seems the blue ribbons tied to the handle echo the blue slopes in the distance. Everywhere they turn, there are hills to be seen. While the groom embraces his bride, she shows off the low back detail of her beautiful lace dress. They each clutch their keepsake vow books, a perfect way to capture and remember both old and new promises shared on such a special day. A modest celebration begins with a wooden table and matching chairs. With a layered blue table runner and white chair cushions, the couple can dine on bread, pears and wine from their antique china and glassware. The photographer steps back to increase the distance between the camera and the couple and the result is exquisite. 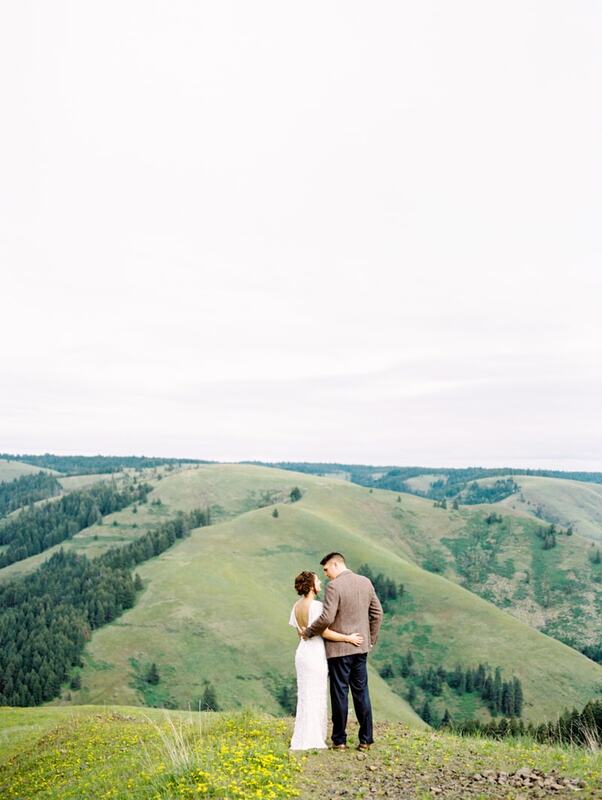 The backdrop becomes a fascinating view of the hills, where miles and miles of grassy slopes eclipse our every expectation. 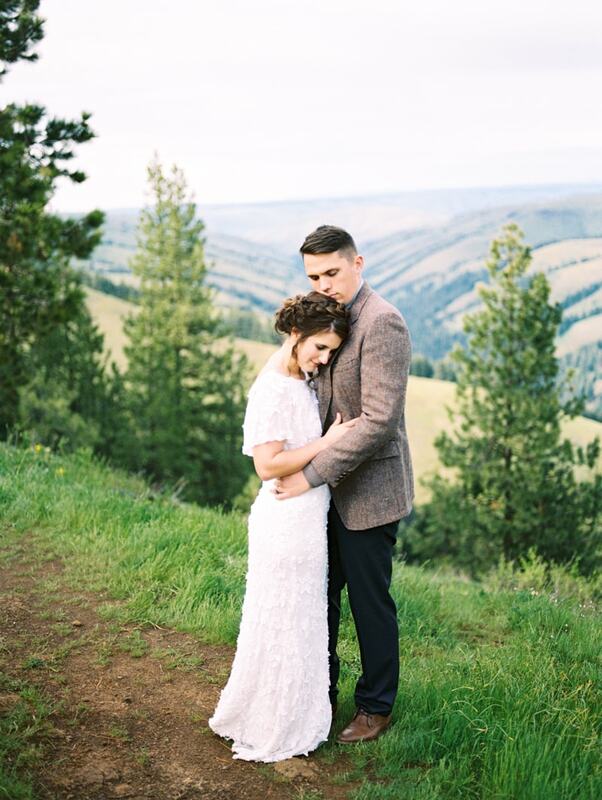 Let this prairie-inspired styled shoot encourage you to think about how creative you can be with a vow renewal. 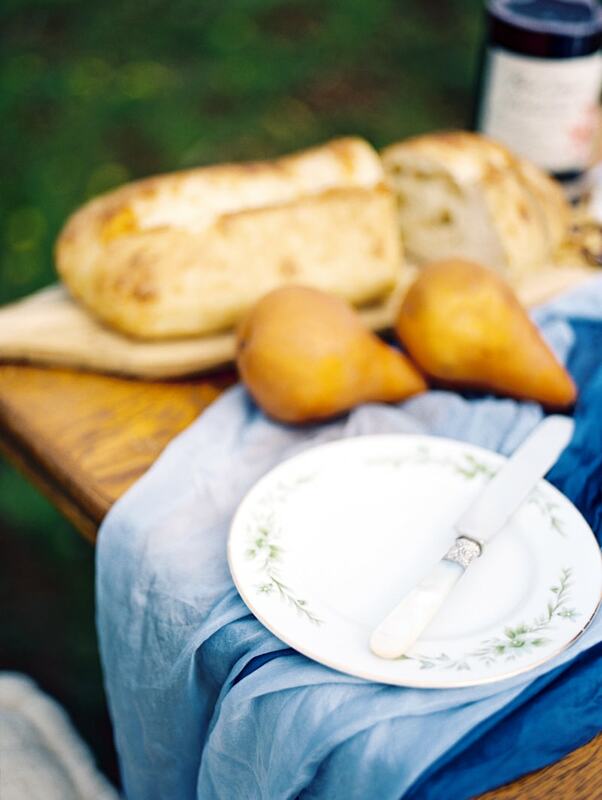 With just a few vibrant colors and accents, a gorgeous ceremony in the countryside can be born. And don’t worry about booking a venue, the scenery will take care of itself.